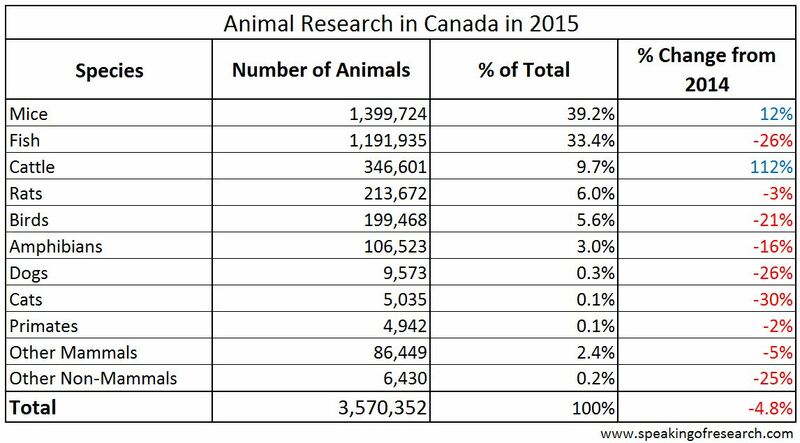 The statistics for animal research conducted in Canada in 2015 have been released by the Canadian Council on Animal Care (CCAC). These numbers reflect research conducted by CCAC-certified institutions and by people working at CCAC-certified institutions, even if the research involves animals located outside of Canada. The criteria for CCAC certification can be found here. This also means that not all animals used for research in Canada are included in these reports. The CCAC reports that in 2015, 3,570,352 animals were used for research, teaching, and testing in Canada. This is a decrease of 4.8% from the 3,750,125 animals that were used in 2014. 84.2% of the animals used in research and testing were conducted on mice, rats, fish, and birds, which was slightly lower than in other countries. However, with the inclusion of cattle, this percentage rises to 93.9%. Similarly to other countries, monkeys (4,942), cats (5,035), and dogs (9,573) comprised a small proportion of animals used for research, together accounting for 0.5% of all research animals, with an overall decrease of 5,592 animals from 2014 for these species. Severe: Procedures which cause severe pain near, at, or above the pain tolerance threshold of unanesthetized conscious animals. It is important to understand that every animal in a group will receive the highest category of any single animal in that group, so if a study involved giving different animals different doses of a compound (in a single study), then all animals would receive a category of invasiveness equal to that received by the highest dose group. For further details on what these categories mean, please see here. In 2015, 31.1% of experiments were classified as “none” (this includes studies where the animal are anaesthetised and never woken up), 37.4% were considered “mild”, 29.5% were “moderate”, and 2% were “severe”. Animals can be used in more than one protocol, provided these additional protocols do not result in pain. Some animals have been counted more than once in this dataset, which is why the total is higher than the total number of animals used in 2015. These data cannot be compared accurately to animal data reports prior to 2012. 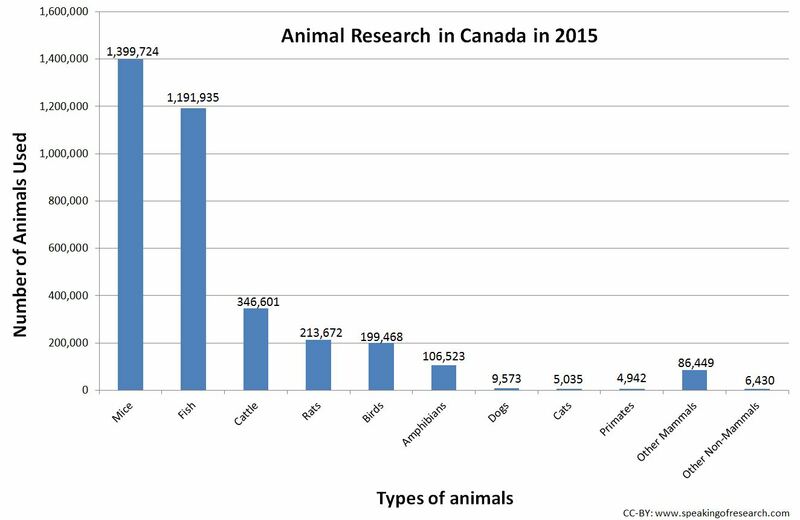 Overall, there seems to be an upward trend in the number of animals used in research in Canada over the last 20 years, although this pattern is not particularly clear due to annual fluctuations. These fluctuations may be a consequence of the accounting procedures used (which changed in 2012), and may only reflect animals used in CCAC-certified institutions. 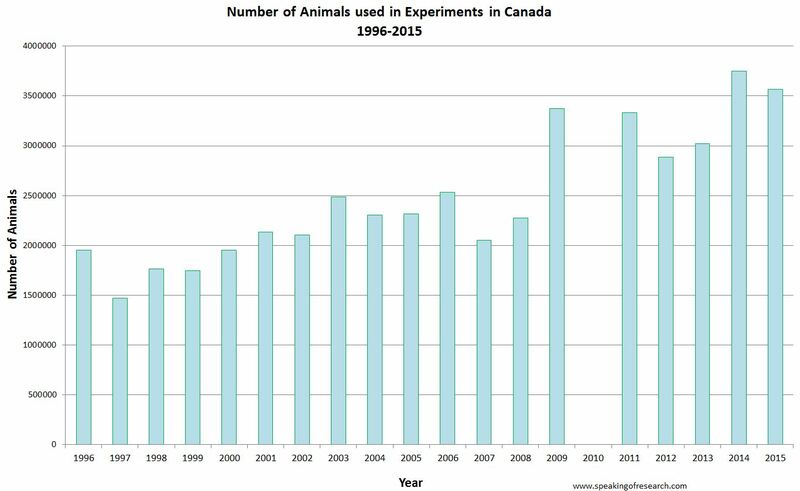 Trends in Canadian animal experiments 1996-2015. 2010 data temporarily unavailable due to an accounting error being fixed. Finally, the CCAC Animal Data Report 2015 provides some information on animal use. The most common purpose of animal experiments was for basic research (61.2%), followed by “development of products or appliances for human or veterinary medicine” (16.0%); studies into human and animal diseases or disorders (12.9%); Regulatory tests (“animal testing”) (5.5%); and finally education and training (4.4%). 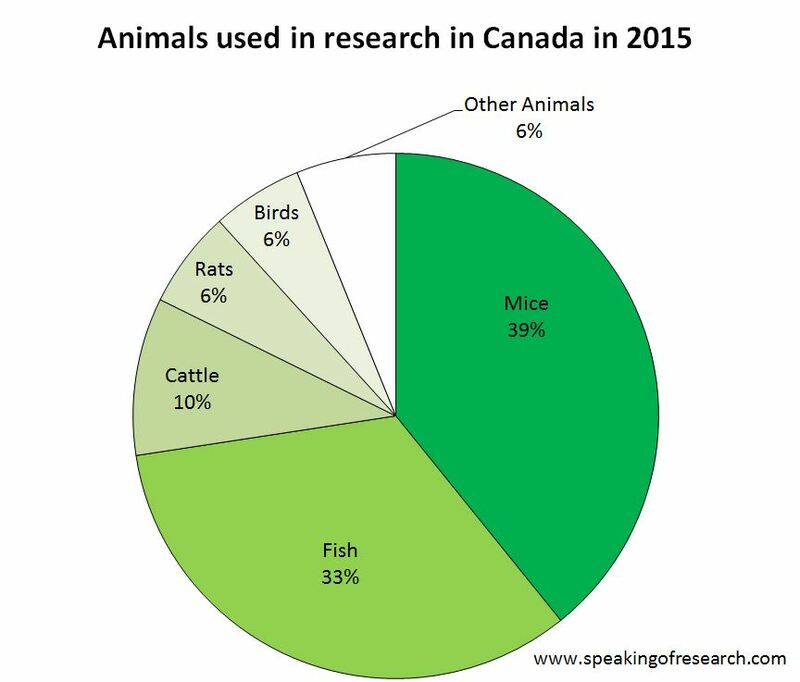 For more information see our Briefing on Animal Research in Canada. Posted on February 13, 2017 February 14, 2017 by EditorPosted in News, StatisticsTagged animal data, Canada, CCAC, Statistics. Next Next post: Help us help you! I don’t believe this article uses the phrase “animal research saves lives”. That said, such calculations are difficult. The six mice who helped Florey and Chain turn penicillin into a viable medicine continue to benefit millions of people every year. Rinderpest was disease that killed tens of millions of cows – it has now been eliminated – who knows how many cows have been saved by the research there. Absolutely animal lives matter, but most of us would not equate their value with that of a human. “Animal research saves lives” – subtract the total number of animals killed during the research from the total the number of people saved by these research. You will get a negative number. That means animal research kills more lives than saves. Animals are not unanimated objects, they are LIVES too.